MAPsport no longer tries to keep stocks up, instead we list a range of worthwhile titles for your guidance, some of which we have and some not. The descriptions will help you decide whether to pursue the book elsewhere, eg Trademe, Amazon, etc. But if we have it, we will pay the GST increase! "The O-Gang", fun stories for kids 7-10, with an O background and set in Australia; $12. New!! "Murder at the 14th Control and the Orienteering Thrillers". Classic short stories by Wilf Holloway republished 2012 by the author. Not exactly the same collection as the original, but in the foreword Wilf hints at a second publication in progress. $25. "Cunning Running", a "what is orienteering" book aimed at Kids 7-10, ideal for school library; $8. "Know The Game: Orienteering", short introduction suitable adult newcomer, colour; $6. "Trail Orienteering", booklet for the participant in the special version of orienteering for the disabled; $10. "Orienteering - A Way of Learning Outdoor Navigation", by New Zealander Peter Wilson. Excellent general book on orienteering in NZ context; was extraordinary value at only $12. If you can find it on Trade Me, buy it, but note the very low original price. "Orienteering - The Skills of the Game" by Carol McNeill, former British elite representative, world W50 Champion in 1994, W55 champion here in NZ in 2000, and a teacher of renown. Very comprehensive general orienteering book; was $43, but see next listing. "Orienteering Skills*Techniques*Training" by Carol McNeill. First new book (2010) in a long time, and it's good. I guess an update of "Skills of the Game", 126p softback, well illustrated. I don't know why general books try and cover getting started as well as advanced competition, but at least this one wastes little time on beginners, by p36 we're onto "Advanced Techniques", and from p54 its about racing and training. National squaddies should know all this, for anyone aspiring to this level, it would be a valuable aid. New shipment reduced to $32. "Orienteering - Pathways to Excellence" by British coaching guru Peter Palmer. Most recent general description of the sport, told through the eyes of a typical family. Out of stock, price was in the $40's. 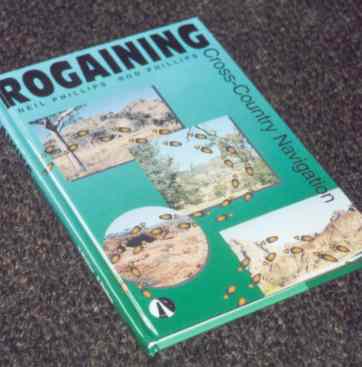 "Rogaining", latest (2000) edition of the classic work by the inventors of this form of long-distance orienteering. Hard-cover with colour photos, section on rogaining in NZ; $35. "Orienteering Techniques" by Gareth Bryan-Jones. Sound advice in a very compact softcover handbook. Out of stock, sold for $15. "Modern Orienteering Training", invaluable reference for advanced orienteers, by Wilf Holloway; years ahead of its time, this still gives valuable advice. Second Edition 2012; $25. "The Complete Orienteering Manual", edited by British coaching guru Peter Palmer. History, equipment, techniques, fitness training, psychological skills, injuries, coaching both adults and children, and orienteering for disabled people, all by experts in their field; Out of stock, price was in the $50's. "Get Fit for Orienteering", by Steve Bird, then Principal Lecturer in Sport Science in Canterbury, England. There have only ever been two books on physical training specifically for orienteering, the Canadian one is out of print, this British one now also out of stock. Price was $33. INJURIES: "Treat Your Own Strains, Sprains and Bruises", by 5 NZ Physiotherapists. Clear day by day instructions, including when to seek the help of a professional; $22. Kiwisport Orienteering Manual. The low-preparation approach to introducing orienteering in primary school. The NZOF recommendation for teachers and anyone else starting off a group of primary-age beginners; latest (2004) edition at $20. "Learning Orienteering Step by Step" by Hasselstrand. The optimum learning staircase of skills for orienteering, the foundation of the Swedish teaching system, up to orange level. Out of print but limited supplies have been tracked down; $25. "Teaching Orienteering". The classic teaching resource with specific instructions for setting up a wide range of activities. Plans for choosing activities for groups at various levels. Panel of British authors includes Jean Cory-Wright, former NZOF Director of Coaching. Out of stock, price was $69. International Standards: IOF Principles for Course Planning at $3; IOF Control Descriptions at $3: and the IOF Mapping Specifications (in colour)at $15. BOF "Course Planning". Fuller and more pragmatic coverage than the IOF booklet; $15. "Organising a Rogaine" by Rod Costigan. The definitive work published by the International Rogaining Federation, and only $25. "Mapmaking for Orienteers" by Robin Harvey. The definitive work in English on mapmaking. Out of stock, price was $60. Also "Simple Maps for Orienteering", from the IOF. Advice on mapping schools and parks; $12. For mail order phone (04) 566 2645, or write to at 5 Atahu Grove, Lower Hutt 5010. We'll invoice with the goods, and you can pay by cheque, bank transfer, Visa or Mastercard. Prices shown include GST.